This past Thursday, a blizzard warning was in effect on the Big Island of Hawaii. Yes, even on Hawaii, it snows. Snow on Mauna Kea, a dormant volcano that stands some 4,200 meters above sea level, is not unprecedented, but it is unusual. 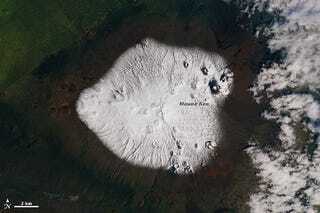 NASA's Operational Land Image Manager captured a rare image of the snow-capped peak on March 10th, as shown above. For comparison, the image below shows the same peak barren on February 22nd. The location of the edge of the snow is closely tied to the elevation at which the temperatures get cold enough for precipitation to fall. At the same time, the location of the edge of the clouds marks the upward limit—also in elevation—for clouds that build from low altitudes toward the top of the peak. In general, clouds build upward during the day as the sunlit ground heats air near the surface and produces gentle, up-slope breezes and convection.